Hello everyone.. I hope you had a great 3 day weekend. 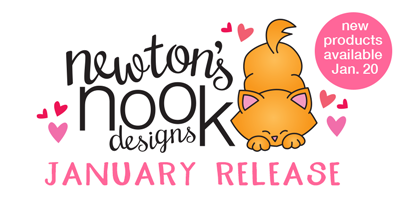 Are you ready for Day 2 of the January Newton's Nook Release? 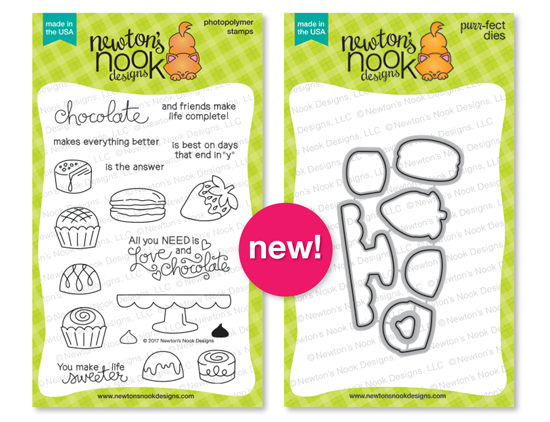 Today we are showcasing the new set Love And Chocolate. This set also has a coordinating dies. I created a Distressed background on a piece of watercolor paper with some Picked Raspberry ink and then I used a cross hatched die cut for a decorative edge. 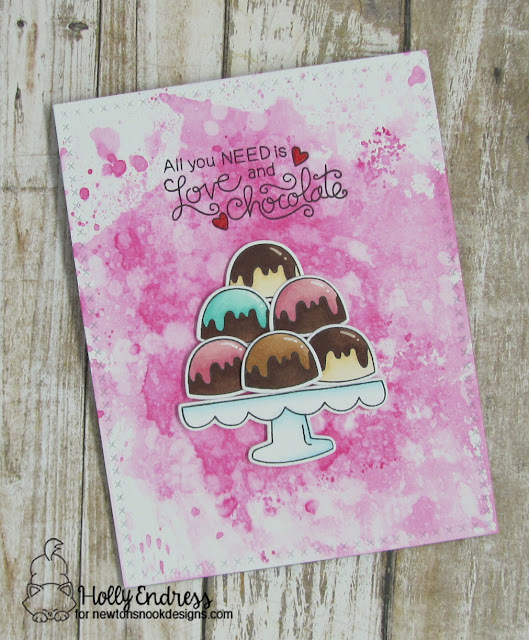 I stamped the sentiment in Black ink and colored the hearts in with a Candy Apple Distress Marker. I stamped the candy pieces and the stand onto some White card stock and colored them in with Copic Markers. Then I used the coordinating dies to cut them out. I adhered the Distressed panel to a A2 size card base and then I added the images with some foam adhesive. These would look look cute with some Glossy Accents on the chocolates as well. Would you like to win the “Love and Chocolate” Stamp Set? Your card is so cute--that is such a great sentiment! Bon bons are one of my favorite cookies - made some for Christmas. Yummy. and yours look just as delicious. Oh my, you've now made me crave ice cream in the morning! Beautiful card! What is better than love and chocolate?! This is really cute, and I love the distressed background too! Awww!!!! Such yummy and delicious card!!! Love it!!! Pretty background for these yummy chocolates. great background and love the cute images in this set. 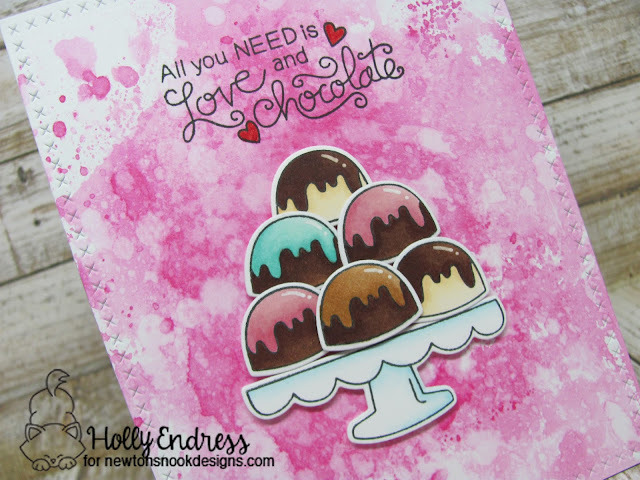 Gorgeous card, love the pink background, and love the coloring of the treats! Fantastic watercolor background! Love the sweet treats as well! Turned out super sweet! Sweet card and the candy looks good enough to eat! Beautiful watercolored background - such a great background for those delectable chocolates!! Oh these look so scrumptious! Delightful card! love the bg for these! Those pretty little chocolates stacked up like that look good enough to eat! Lovely card! Great card! Love the background you created. Love how you did the background.. tell me can you give more information on how you achieved that great look? Great sentiment in this set. Your bonbons look delicious! Yum... love that stand of goodies! Such a fun new set! Beautiful background, really nice pink. Great card, love these cupcakes. I AM CRAZY for this stamp set!! It is adorable!!!!! Those chocolates just look scrumptious! I love your textured background! What a sweet card! Love the background and your coloring of the images! These chocolates look so yummy! I love this new set! What a beautiful card! I love the colors and distressed look of the background, compared to the clean look of the bon-bons on top! The coloring of the candy is fantastic-they look so real I want one right now! I love this stamp and die set, it is my favorite of the whole release and each of you wonderful,designers is giving me more and more reason to love it.